AFTER HURRICANE SANDY, SOME OF THE BEST DESIGNERS IN THE WORLD SPENT A YEAR DEVELOPING NEW IDEAS FOR REBUILDING THE COMMUNITIES THAT HAD BEEN AFFECTED BY THE STORM. WHAT CAN WE LEARN ABOUT RESILIENCE FROM THEIR PROPOSALS? PUBLIC JOURNAL PUT THE QUESTION TO A PANEL OF EXPERTS. ON OCT. 29, 2012, at approximately 8:02 p.m. EST, Hurricane Sandy made landfall in Atlantic City, N.J. Two days earlier, the storm had hit Santiago de Cuba, Cuba, where residents reported just hours after Sandy passed that “everything is destroyed.” As it moved north over the next three days, the storm grew. By the time it touched down on the New Jersey shoreline, Sandy was more than 900 miles wide, making it the largest Atlantic hurricane ever recorded. The effects were devastating. In less than 36 hours it wreaked havoc in 24 states, killed 109 people, and left more than 6 million residents without power. The hurricane, which came to be known as “Superstorm Sandy,” ultimately caused nearly $68 billion in damages and losses, making it the second costliest storm in U.S. history (Hurricane Katrina totaled $108 billion). 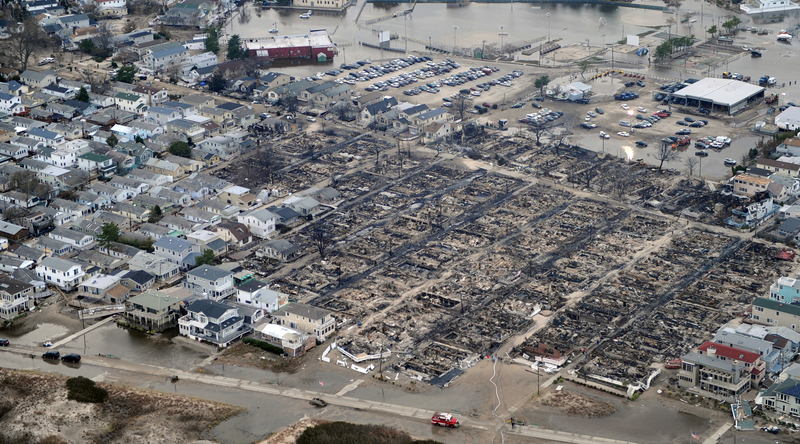 Less than six weeks later the U.S. government responded, and President Barak Obama issued an executive order establishing the Hurricane Sandy Rebuilding Task Force. In June 2013, the Task Force launched an unprecedented urban planning and design competition called Rebuild by Design. Following three months of on-the-ground research and community engagement, teams spent another nine months immersed in collaborative work sessions informed by an advisory board and a rotating cast of resilience experts. In June 2014, after more than a year of work, six winning proposals were announced. Each represents a unique approach to rebuilding and protecting against future storms that simultaneously incorporates economic development, ecological restoration, and public resources. The government allocated $930 million in total to the winning proposals, and although this may seem like a lot, each team had proposed a multi-billion-dollar project. To be sure, there is no way any of them are going to break ground soon. So what was the point? From the start, RBD was about generating ideas and moving the conversation about resilience forward on a national scale. It was about bringing together some of the best designers in the world and getting them to focus their expertise on developing innovative ideas around resilience and rebuilding. While some question whether the “brand-name” firms in the competition, including the Office for Metropolitan Architecture (OMA) and the Bjarke Ingels Group (BIG), were necessarily the best qualified to be working on such crucial civic projects, it is important to recognize the unique value they provided: Such firms helped to bring tremendous visibility to resilience work within the design industry. For the hundreds of smaller, lesser-known design studios that look to Rem Koolhaas and Bjarke Ingels as trendsetters, and for the many thousands of students who dream of working at firms like OMA and BIG, RBD was a milestone in raising awareness about public interest design and the capacity for design to incorporate social, environmental, and economic outcomes.Overall, RBD was unquestionably an immensely valuable process, but what about the deliverables it produced? Did they accomplish the goal of developing innovative and implementable proposals that foster social, economic, and environmental resilience? PUBLIC put the question to six resilience experts, each from a different field, in an effort to understand the competition and the winning proposals from a diversity of perspectives. Sandra Knight, senior researcher in civil and environmental engineering at the University of Maryland, director of the university’s Center for Disaster Resilience, and former deputy associate administrator for mitigation at the Federal Emergency Management Agency (FEMA). Robert Young, professor of coastal geology and director of the Program for the Study of Developed Shorelines at Western Carolina University. David Perkes, founder and director of the Gulf Coast Community Design Studio and a former Loeb Fellow and White House Champion of Change. Ceara O’Leary, Enterprise Rose Architectural Fellow, designer at the Detroit Collaborative Design Center, and a former community designer at bcWORKSHOP. 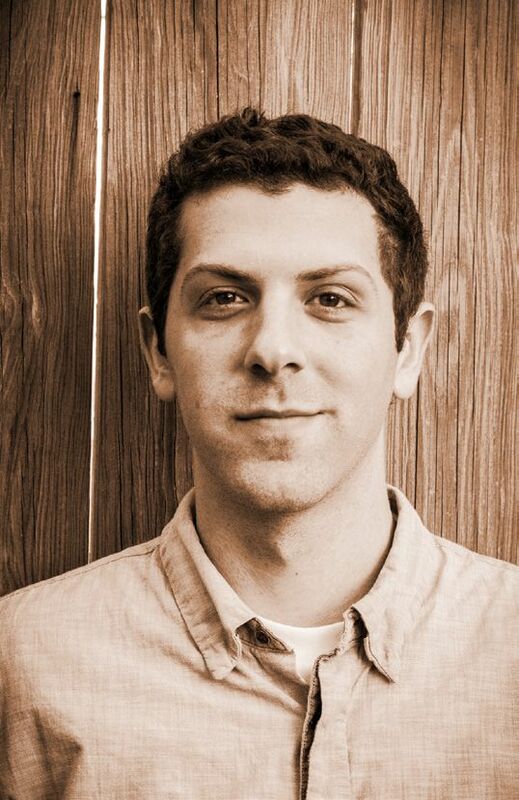 Mike Grote, director of building programs at Alembic Community Development, lecturer in sustainable real estate development at Tulane University, and a former program manager at Architecture for Humanity. Tim Beatley, chair of the Department of Urban and Environmental Planning at the University of Virginia, professor of sustainable communities, and the author of numerous books on resilience and environmental sustainability. For the purposes of this article, PUBLIC has paraphrased many of the comments from these experts. While nearly all of the following content came from the collective expertise of the people we spoke with, the manner in which it is framed represents the author’s views, not necessarily those of our panel. The New Meadowlands project articulates an integrated vision for protecting, connecting, and growing this critical asset to both New Jersey and the metropolitan area of New York. 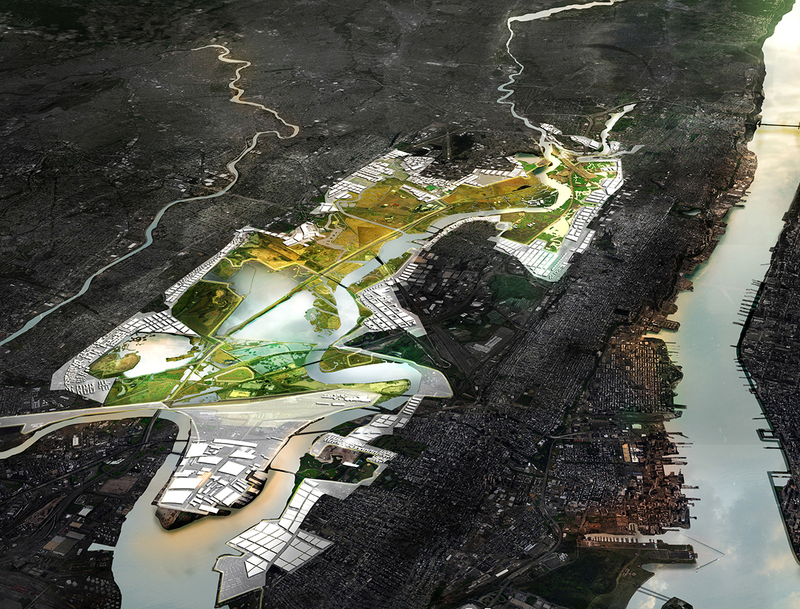 Integrating transportation, ecology, and development, the project transforms the Meadowlands basin to address a wide spectrum of risks, while providing civic amenities and creating opportunities for new redevelopment. prepare — constitute the core of what it means to be resilient. Although we tend to think of resilience in terms of physical infrastructure such as buildings, bridges, and roads, it is equally important to address it from social, economic, and ecological perspectives. Resilience means protecting homes and businesses, but it also means protecting access to healthcare, protecting local job stability, and protecting ecosystems. With this in mind, our experts helped analyze the six RBD proposals to explore the lessons and insights within each one. The project is rooted in the ecological restoration of the area, focusing on the strategic placement of berms, marshes, and ponds. These ecosystemrestoring features double as disaster-protection measures by offering physical protection from stormwater surges and natural catchment areas that will reduce stress on the sewage system during storms, making the area less susceptible to flooding. This strategic ecological restoration also includes public amenities through new parks and scenic recreational areas, as well as new transit lines to provide access, both of which, in turn, are projected to help raise economic value of the area and bring new jobs to surrounding neighborhoods. This integrative approach is present in nearly every winning proposal because it was essential. The strength and robustness of any plan for resilience is dependent on its level of interconnectivity. Redundancy through overlapping systems is a defining aspect of true resilience. It not only ensures multiple lines of defense during a crisis, but it also provides mutual benefits and sustained support for each system. The design teams showed that creating real resilience requires interconnected systems and approaches that incorporate multiple outcomes. In this case, the New Meadowlands proposal developed a way to restore ecology, provide public amenities, and catalyze economic development. 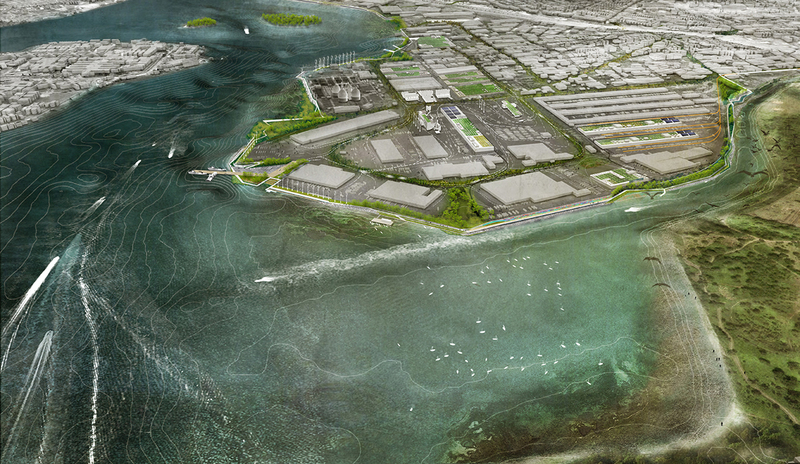 The 1-square mile of Hunts Point peninsula is the intersection of the local and the regional in rebuilding by design. What’s at risk in Hunts Point is the hub of the food supply for 22 million people, a $5 billion annual economy, over 20,000 direct jobs, and livelihoods of people in the poorest U.S. Congressional District. HUNTS POINT LIFELINES builds on assets and opportunities of regional importance, and a coalition of national leaders in community environmental action, business and labor, to create a working model of social, economic and physical resilience. 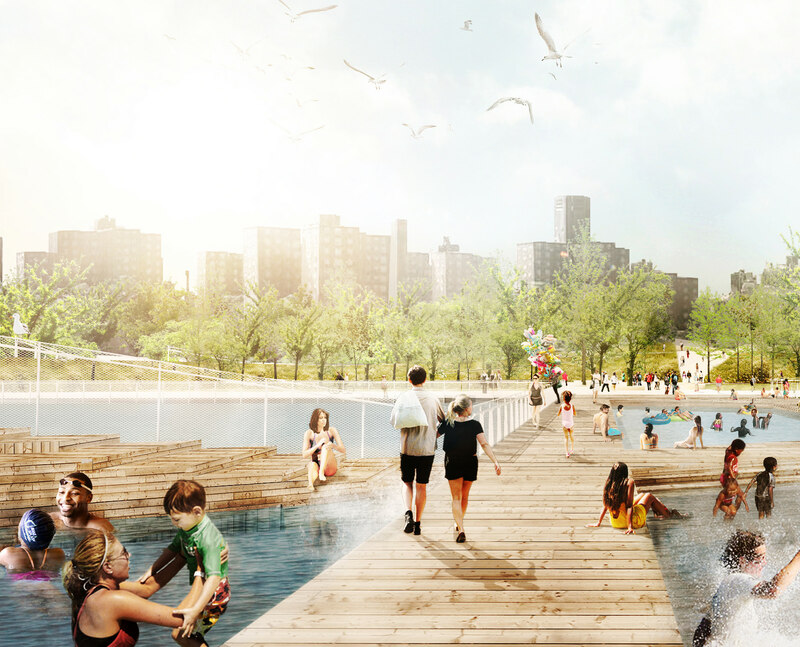 The project demonstrates a model of WORKING WATERFRONT + WORKING COMMUNITY + WORKING ECOLOGY that applies in maritime industrial areas across the region. Although this type of integrative approach is essential, our experts in real estate development and civil engineering raised questions about flood-risk reduction and incentivized behavior.Could some of the proposals actually encourage more risky development? Similar to the New Meadowlands proposal, the Living With the Bay proposal details a number of highly integrated approaches to rebuilding areas of Nassau County,N.Y.’s South Shore, an area that was hit particularly hard by Hurricane Sandy. Although the proposal is highly strategic and expertly addresses ways to rebuild the area, it raises larger questions about whether those major infrastructural improvements will actually invite increased real estate development in an already risky and dangerous area. If we continue to make infrastructure larger and more robust, what is the message we’re sending to residents about the risks of living in that region? Other areas, however, are simply too valuable not to rebuild — or, more accurately, too valuable not to protect. The Hunts Point Lifelines proposal is a prime example of this. Hunts Point is a major hub for the New York and New Jersey food distribution industry; not only is it a critical link in the food supply chain for 22 million people, but it’s also an employer of more than 20,000. While those jobs are all critical for food distribution distribution, they also necessitate a high volume of truck traffic in the community, which leads to increased air pollution, higher asthma rates for locals, and more dangerous roads for pedestrians and children. The Hunts Point Lifelines proposal integrates a number of key features to address these pressing challenges. The proposed “Cleanways” would improve air quality, provide greater safety for pedestrians, and reduce costs for businesses owners by expediting transit at critical points. 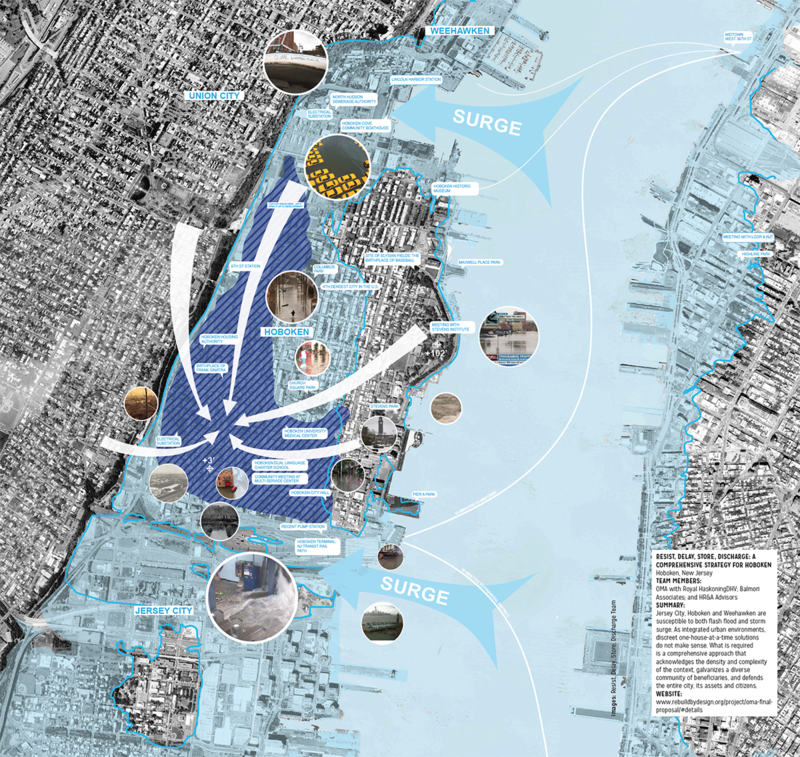 Similarly, the proposal for the construction of a massive “Levee Lab” functions to protect local business from future floods, provide new public space amenities, and help stabilize the ecology of Hunts Point. As with the Living With the Bay Proposal, though, it’s important to take a step back and look at some of the larger challenges. To be sure, protecting the food distribution industry is absolutely critical, but so is addressing broader socioeconomic resilience. Hunts Point is part of the poorest congressional district in the country; in 2010, according to the U.S. Census Bureau, more than half of that district’s population lived below the poverty line, and it suffered from a 60% unemployment rate. These statistics help provide a broader perspective on what is most needed in Hunts Point: job training and new employment opportunities. Protecting the safety of Hunts Point because of its status in the food-supply chain is essential, but creating real resilience means more than protecting the environment and the local economy. It also means helping sustain the individuals and families in the community so that they can withstand the financial burden of future natural disasters. Resilience is dependent on interconnectivity of systems — physical and environmental systems just as much as social and economic ones, and not only at the regional scale, but also at the scale of families and individuals. How do we keep Long Islanders safe in the face of future extreme weather events and sea-level rise? How do we ensure that the next big storm won’t be as devastating to the region as Sandy? 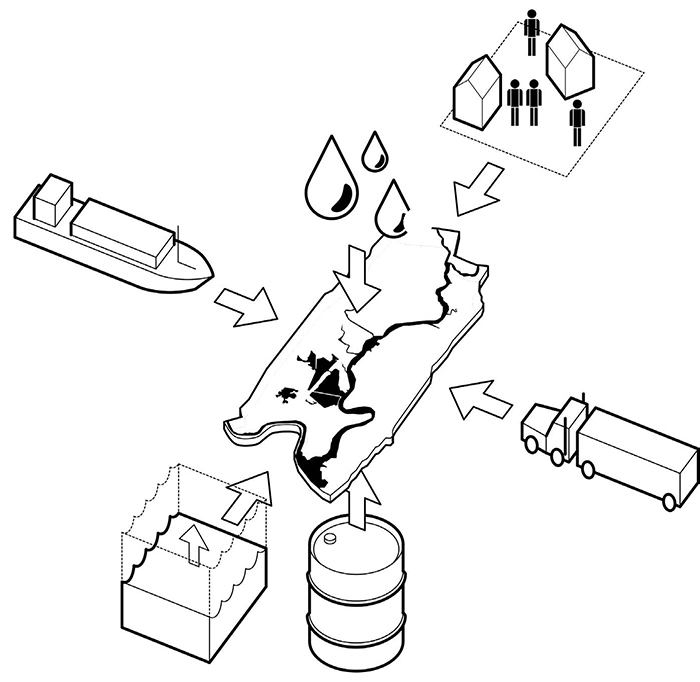 And what can we do to improve the water quality and quality of life in the region? What can we do to make “bay life” safer, healthier, more fun, and more accessible? What Does Long-Term Really Mean? For RBD, the vast majority of resilience planning was designed to keep communities and shorelines in place, but make them less vulnerable and more capable of surviving future storms. That is an excellent approach for the near future, but as our expert in coastal geology pointed out, “Rebuilding in vulnerable areas will be a loser in the long run. We need to seriously consider the ramifications of rebuilding in the places that we know are going to be destroyed again.” This raises essential questions about what “long-term planning” really means. Looked at from this perspective, RBD’s winning proposals appear to only showcase a certain kind of solution, one rooted in rebuilding, which in some cases is inherently shortsighted. This is not to say that we should simply abandon every area that was affected by Hurricane Sandy, but there are specific low-lying areas that are particularly vulnerable to flooding. We should be realistic about the dangers of rebuilding in such places. Going back to the principles of resilience — withstand, rebound, adapt, prepare — we know that interconnected systems can help mitigate risk in vulnerable areas. The Resist, Delay, Store, Discharge team addressed this directly through its four-pronged approach. The proposal focuses on Jersey City, Hoboken, and Weehawken in New Jersey, all of which are highly susceptible to both flash floods and storm surges. Resist, Delay, Store, Discharge integrates hard infrastructure (walls, levees, and barriers) to block storm surges at critical locations and soft infrastructure (parks, green roofs, and bioswales) to absorb and retain water overflows to reduce flooding, all supplemented with policy recommendations that prepare for future urban infrastructure to be more resilient. In addition, many of these features double as public spaces and amenities for local communities, which in turn will help raise the area’s economic value and provide healthier urban environments for all. While this approach is highly integrative and represents great strategic planning to both avoid and mitigate the damages caused by storms, it ultimately relies heavily on hard infrastructure, on physical barriers designed to block or barricade against a storm. There is a long history within both the Army Corps of Engineers and FEMA of investing in hard infrastructure as flood prevention, but the prevailing knowledge is changing that. Our experts in architecture, coastal geology, and construction agreed that these hard infrastructural approaches are fundamentally flawed, both physically and philosophically. Physically, building walls is simply not the answer. We know from countless disasters that no matter how strong a wall or levee might be, inevitably a storm capable of overwhelming it will arrive. By building barriers, we set ourselves up for future failure, period. To be sure, there are certain areas where we will do whatever it takes, including building walls. For example, we will ensure that Lower Manhattan doesn’t go under water because it’s too valuable to lose, but for the rest of the city, or places across the river, are walls really the answer? Are these truly “longterm” solutions, or are we really just dealing with the next 50 to 100 years? 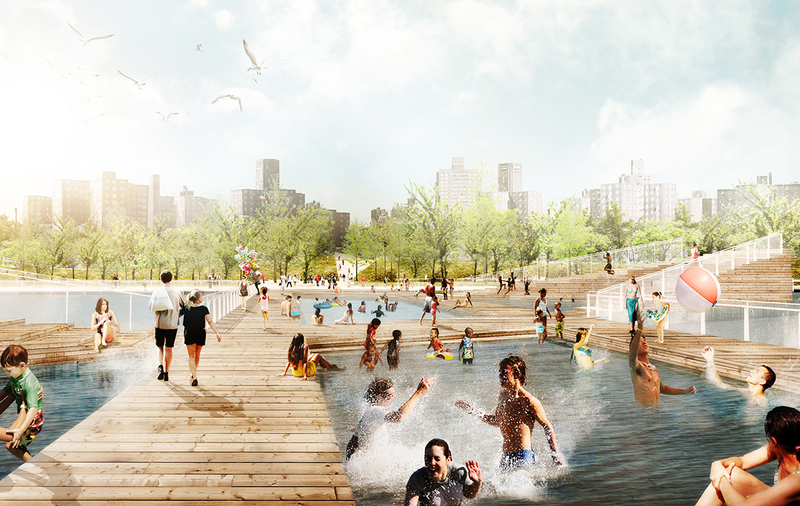 We see this approach very clearly in the Big U proposal, which transforms the southern tip of Manhattan into a expansive multi-use park that would not only retain massive amount of water during storm surges thus reducing the risk of flooding, but would also encourage economic development, foster healthy lifestyles, and provide much needed green public space in the Financial District. The plan also includes structural barriers that run up both sides of Manhattan, stretching up to West 57th Street and East 42nd Street. While the park at the tip of the city is incredibly appealing for its public space amenities and long-term potential, it is somewhat unrealistic. This is not to say that Big U isn’t technically feasible or programmatically ingenious. It builds off of precedent projects of similar scale in the Netherlands that have been successfully constructed. The Big U is a protective system around Manhattan, driven by the needs and concerns of its communities. Stretching from West 57th street south to The Battery and up to East 42th street, the Big U protects 10 continuous miles of low-lying geography that comprise an incredibly dense, vibrant, and vulnerable urban area. This is an important point: The Big U is rooted in a sociopolitical landscape that does not exist in the U.S. Despite the proposal’s technically feasibility, it’s hard to imagine a project of this scale becoming real. Yet the renderings are so undeniably appealing that it’s not hard to see why the Big U received the most money ($335 million) of any RBD winner. This raises an important question about public interest design work as a discipline. Our expert in architecture put it quite well: “If we’re really committed to the public’s interest, then is there a point at which we’re overselling something instead of just giving the facts and letting the public decide?” It’s a vital critique when talking about public interest design: How cautious do we need to be about getting too good at pitching ideas? Perhaps more importantly, a large part of the Big U project relies on new structural barriers around the edges of lower Manhattan. While this may have to be the answer for certain high-value areas, it brings up other, more fundamental issues. Philosophically, building structural barriers leads to questions of democracy and equality. Why do some neighborhoods get a barrier wall, but not others? Building large-scale structural barriers could potentially create a kind of civic arms race in which every neighborhood is demanding a wall for protection. What kind of future does that lead to? Do we really want a city that’s walled off from the rest of the world, or a city whose protective barriers separate, rather than unite, its communities? Could there be a way to help rebuild and maintain communities while simultaneously retreating from certain high-risk areas? Our expert in coastal geology offered some interesting ideas for why and how this might happen. When Does Industry Trump Ecology? Our experts in coastal geology and environmental sustainability agreed that such breakwaters would help reduce the risk of flooding under typical conditions; however, it is unclear how much they would help communities during a storm surge at the scale and magnitude of Hurricane Sandy. The Living Breakwaters team backed up its proposal with advanced computer modeling to show how the breakwaters would affect water patterns, but our experts argued that there are simply too many variables to predict. 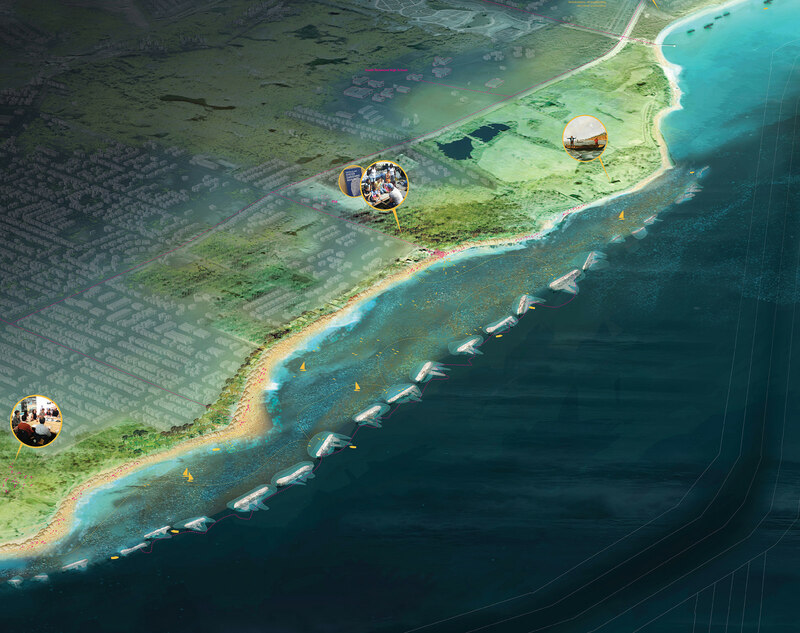 The proposed breakwaters would likely cause, among other things, changes to water-flow patterns, sediment regression, and potentially species shifts in coastal ecosystems. Beyond these large-scale shifts are numerous other positive and negative feedback responses that cannot be modeled. In short, it is simply too hard to predict how many factors will be affected. Perhaps at some point we may have to say “environmental impacts be damned, we need to save this shoreline,” but we should be very thoughtful about how such a location is selected. As an alternative, it’s important to think not only about large-scale changes like breakwaters and levees, but also about how small-scale mechanisms can collectively have a significant impact. Our experts in community design and coastal reliance both posed the question: Are there ways we can decentralize the mitigation process? How could small-scale changes, such as permeable pavers and pocket parks, help reduce flooding? While large-scale interventions are essential, they are not the only answer. When a disaster at the scale of Hurricane Sandy happens, there is often a tendency to have a knee-jerk reaction that is equal and opposite. Unfortunately, this type of immediate response is often oversimplified and diluted down to, “Well, we need to do something broad and sweeping because if we do it at the granular level, we’ll never get there. It will be too slow and too expensive.’ It would be interesting to see designs that challenged this view points and demonstrated the capacity of small-scale collective action. This is also tied to a larger critique of the reactive nature of resilience planning. The U.S. tends to respond after a storm hits rather than consistently investing in preventative measures along the way. We need more focus nationally on proactive resilience planning, not only because it will save lives and communities, but also because it will save money. Every year the U.S. government is forced to spend billions of dollars in off-budget funds on disaster recovery, most of which is largely used without due consideration. Funds simply go wherever they are most needed for the short-term, and solutions generally address only immediate needs, not long-term solutions — guaranteeing that even more money will have to be spent somewhere down the road. What if each RBD team was led by a brain trust of community developers, economists, bankers, federal agents, and real estate professionals whose job it was to help direct proposals toward long-term financial feasibility? If that were the case, then maybe some of these projects would actually get built. Regardless of the approaches that the RBD teams took and the lessons that can be learned from their proposals, it’s important to look at the big picture. Nothing has actually been built yet, so the process of review and critique can function constructively to help direct projects to be more equitable, safe, and sustainable. But beyond the proposals themselves, the competition as a whole offers a number of highly beneficial outcomes that should not be overlooked. There was intense exchange and review among the design teams. Many team leaders have publicly commented on the tremendously beneficial experience that RBD provided, that there were dozens of lessons learned by hearing from the different teams and engaging in the process. Every single team leader brought up the immense amount of new knowledge they gained from engaging with one another, and one would hope that as a result, the practices of some of the world’s most famous architects will be more attuned to resilience planning and community engagement, both of which are desperately needed in the design industries. Furthermore, while it’s easy to critique the feasibility of such large-scale infrastructure projects, that’s not to say there’s no value in the proposals and what teams produced. One of the most important early steps in the process of resilience work is to have a framework for conversation, particularly for engaging with communities and civic leaders. What the winning teams have produced for RBD is a perfect starting point for this. Our experts in public engagement and disaster relief planning both made sure to point out that teams have created a huge set of materials for public outreach, awareness building, and conversations around planning, all of which are an essential part of any sustained effort toward resilience. These proposals can be used to facilitate conversations with their respective communities to discuss what the best options are and how to move things forward — a prime opportunity to pair the technical expertise of designers and planners with the local expertise of communities and stakeholders. The real question is what will happen next.